The moon will blot out the sun next week in the only total solar eclipse of the year, providing a rare skywatching treat for parts of the Southern Hemisphere. The total solar eclipse will occur on Tuesday, Nov. 13, but it will actually be Nov. 14 local time for observers south of the equator. The eclipse's partial phases will be visible from all of Australia, New Guinea and New Zealand, as well as part of Antarctica and a far-southern slice of South America. 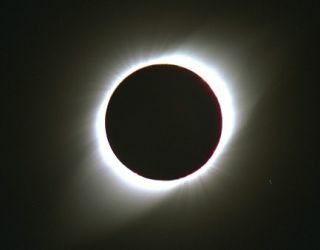 The total solar eclipse, however, can only be seen only from a narrow corridor running southeast across Queensland and the Northern Territory in Australia. Next week's skywatching treat will be the first total eclipse to be visible since July 11, 2010, when the moon blocked out the sun's disk over the open ocean waters of the South Pacific. Total solar eclipses occur when the moon lines up perfectly with the sun in the sky, obscuring the entire solar disk and casting a shadow over observers here on Earth. The lunar shadow’s first contact with Earth next week occurs at 3:35 p.m. EST (2035 GMT) on Tuesday. At this time, the shadow's path will be 78 miles (126 kilometers) wide, and the total phase will last 1 minute and 41 seconds. The North and South Goulburn Islands, located in Auray Bay off the northern Arnhem Land coast, are tucked just inside the shadow’s northern edge and lie just to the east of the sunrise terminator. The islands are Aboriginal-owned, so permits from the Northern Land Council are essential for any skywatchers hoping to watch the eclipse from there. The Goulburns are not set up for tourism, but intrepid sailors and fisherman occasionally may find themselves on the shores. Darwin, the capital city of the Northern Territory, is positioned 155 miles (240 km) to the west of the sunrise terminator, where the shadow first touches down on the Earth. Maximum eclipse will come four minutes before local sunrise, which occurs at 6:11 a.m. on Wednesday, Nov. 14 local time. As a consequence of this geometry, the dawn twilight may appear unusually subdued. When the sun finally emerges over the east-southeast horizon, Darwin’s population of 125,000 will witness — if they’re awake and the local skies are clear — a striking and very unique sunrise. The sun will appear as a narrow (albeit waxing) crescent with its cusps pointing downward; the moon will be covering about 92 percent of the sun at that time. During the first two minutes that it is in contact with the Earth, the shadow, traveling rapidly southeast, will cut diagonally across the Gulf of Carpentaria, a large, shallow sea enclosed on three sides by Northern Australia and bounded on the north by the Arafura Sea. As it begins its jaunt across the Gulf, the shadow’s southern edge will graze the north shore of Bickerton Island, home to a small Aboriginal community of 140 people, and then cut across the northernmost portions of Groote Eylandt, which is owned by the Anindilyakwa people (who still speak the isolated Anindilyakwa language). After traversing the Gulf, the shadow will come back onshore for a two-minute trek across northern Queensland. Most eclipse visitors to Australia will likely congregate in the city of Cairns, a rapidly expanding city of 147,000 (as of 2010) that finds itself within the totality path and 11 miles (18 km) south of the eclipse center line. Cairns is a popular travel destination for foreign tourists because of its tropical climate and proximity to attractions such as the Great Barrier Reef. Here sunrise will be at 5:35 a.m.; it will be followed just 10 minutes later by first contact: The new moon will appear to take a tiny bite out of the sun at the 11 o’clock position on its disk. During the next 53 minutes, that indentation will grow noticeably, eventually cutting the visible solar disk down to a narrow crescent. Finally, as the last bit of the sun is extinguished at 6:38:34 a.m. local time, the glorious corona of the sun will come into view and the sky will dramatically darken to an extent similar to what it had been just over an hour and a half previously — that is, 30 to 40 minutes before sunrise. Cairns will witness a total eclipse lasting 1 minute and 58 seconds; however, observers who journey to the north to try to position themselves on the center line (located roughly midway between Clifton Beach and Port Douglas) can extend the duration of totality by 7 seconds. The sun’s altitude for totality’s onset at Cairns is 13.8 degrees above the east-southeast horizon. The umbra will then be an ellipse, with its major axis measuring 88 miles (143 km). A few minutes later, the moon's shadow will cross the International Date Line, and the date of the eclipse will transition to Tuesday, Nov. 13. The instant of greatest eclipse occurs at 2211:48 GMT on Nov. 13, when the duration of totality lasts 4 minutes, 2.2 seconds and the sun stands 68 degrees above the ocean waves. The path of totality finally comes to an end 610 miles (980 km) west-northwest of Santiago, Chile, at 2348 GMT as the shadow leaves the Earth’s surface along the sunset terminator, about midway between the San Felix and San Ambrosio Islands (to the north) and Juan Fernandez Islands (to the south). On Nov. 3 of next year, the path of a hybrid solar eclipse will stretch southeast from off the coast of the Carolinas and across the North Atlantic Ocean, finally making landfall in the African nation of Gabon and then turning east-northeast across equatorial Africa before finally coming to an end over southern Ethiopia. This eclipse will be annular in its initial stages, then transition into a total eclipse for the rest of the path. The duration of totality will reach a maximum of about 100 seconds at a point in the Atlantic several hundred miles off the coast of Liberia.